No, the Silk Road was not a path made of worm-woven textiles. Even its historical fame as an elaborate trade system, exchanging rare goods like cloth and spices between the East and West, does not give it justice. More than just a highway for world economies, the Silk Road served as a vascular system for culture. Italians learned Persian for better bartering, Mongols crowded to hear the bright melodies of Chinese flutes, and travelers who braved the harsh cold of the Pamir Mountains met with awe the nomads who called the unforgiving peaks their home. For professor Roxann Prazniak and her 200-level history class “Crossing the Pamir Mountains,” the Silk Road is a class syllabus. Students study the lives of explorers and rulers who traversed the unforgiving land of the ancient trade route, from Alexander the Great in the 3rd century BCE to Marco Polo in the 14th century. Points along the road highlighted here are but a sample of those students engage with in the class. They show how goods, technology and culture traveled hundreds of miles to be used, adopted, and altered by other societies for their own purposes. In this way, the ancient route helped lay the foundation for the internationally connected world we know today. 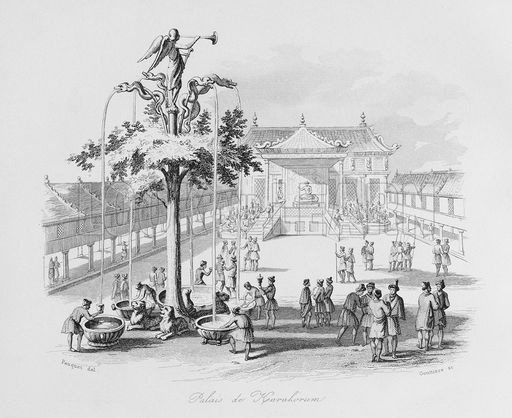 Emperor Genghis Khan commissioned a French silversmith, Guillaume Bouchier, to travel to the Mongolian capital of Karakorum, where he designed The Silver Tree. Four snakes made of gold wrapped around the trunk, each of which poured an alcoholic drink popular in its respective region. The north-facing serpent (representing present-day Mongolia and Russia) poured fermented horse milk. Grape wine flowed from the south-facing serpent (the Middle East); mead, from the West (Europe); and rice wine from the East (China). At the top of the fountain stood a golden angel holding a trumpet. When the fountain was running low, a device triggered, causing the angel to blow into the trumpet, signaling servants to refill its reservoirs. It proved an effective way to entertain guests. Gautama Buddha, or simply Buddha, became the first person to achieve Nirvana in Bodh Gaya, a village in northeast India. Born in the 6th century BCE in modern-day Nepal to wealthy nobles, Buddha fled his privileged circumstances to find a solution to life’s seemingly inescapable suffering. For six years, he walked through forests, eating nothing. 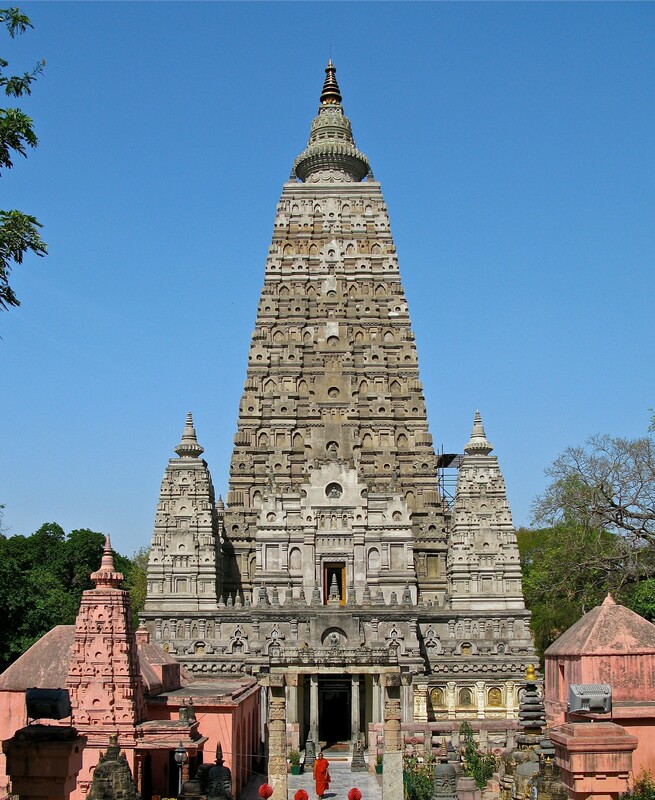 When he reached Bodh Gaya, he stopped and meditated under a fig tree. He stayed motionless under the tree for seven days, ridding himself of desires and fear. On the eighth day he achieved Nirvana, a state of profound enlightenment that transcends human suffering. The Mahabodhi Temple, a UNESCO World Heritage Site, is a Buddhist temple in Bodh Gaya marking the place where the fig tree grew. 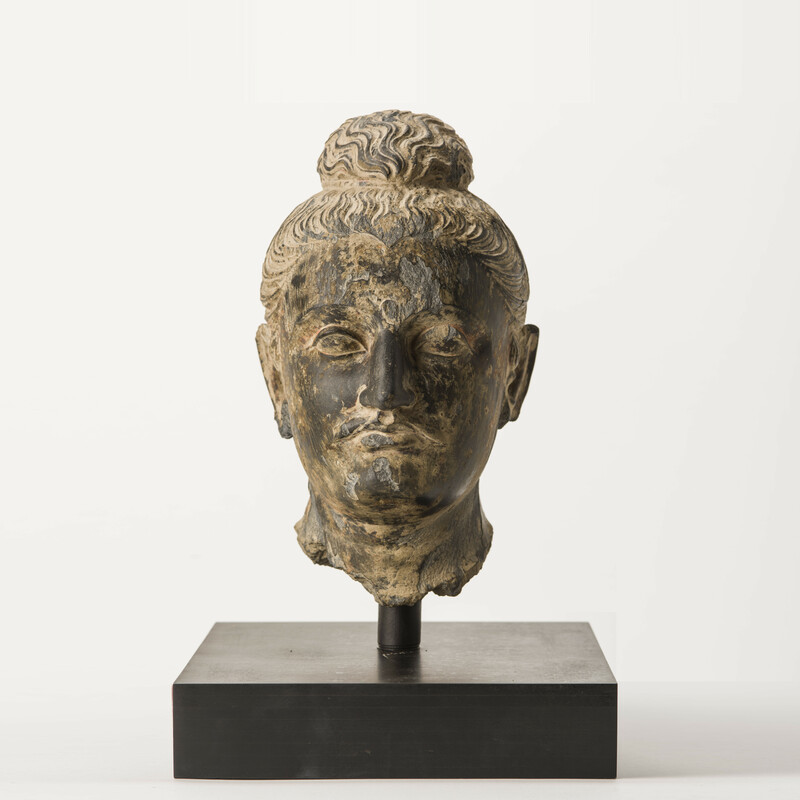 bust displayed in the Jordan Schnitzer Museum of Art on the UO campus, date back to the 3rd century, and are among the earliest depictions of the Buddha. Called the “Roof the World” by early Persians, the Pamir Mountains in Central Asia are home to some of the world’s highest peaks. They meet the Himalayas in Central Asia, and have served as both a geographic and cultural center where East meets West and North meets South. A rugged branch of the Silk Road, the Pamirs host notoriously long, cold winters. Still, a scattering of nomadic peoples have etched lives into the flat tundra grasslands that surround the base of the Pamirs. Societies like the Chinese and Europeans referred to these nomadic steppedwellers as barbarians, portraying them as bloodthirsty and primitive. On the contrary, many of these tribes, among them the Samartians and the Mongols, enjoyed the finer things in life. They encountered many traders along the Silk Road as they moved their livestock from steppe to grassy steppe, buying precious textiles from Iran and lining their fur garments with silk from China. They also had rich musical traditions, and many scholars credit them with crafting the first bowed instrument, a “horse head fiddle,” an ancient relative of the modern-day violin. The first universal history ever recorded owes its creation to Rashid al-Din, a 14th-century historian. 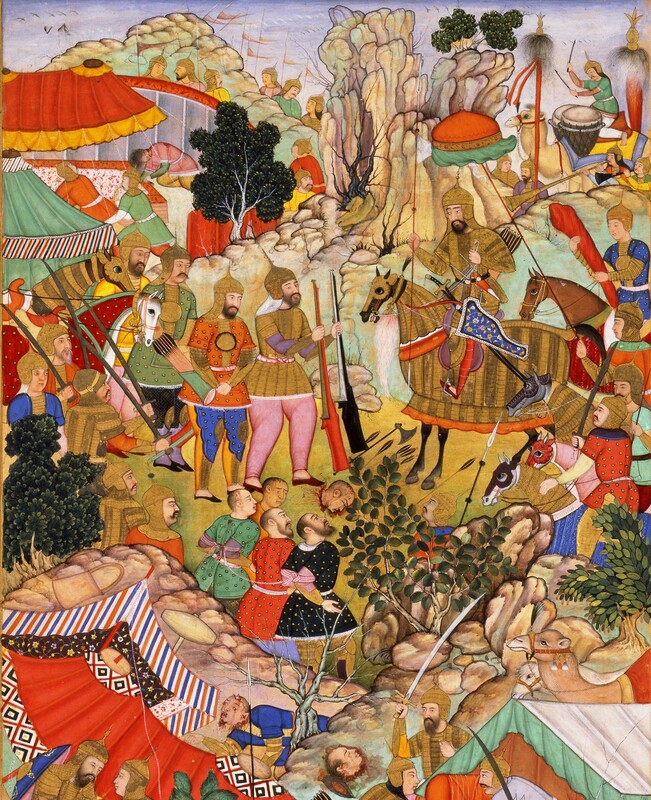 Working under the Mongol ruler of Persia, Rashid documented the Islamic and Persian culture of his home, as well as that of the Turks, Franks, Jews, Chinese and Indians with whom he came into contact. To complete his records, Rashid sought the help of high officials in the Mongol Empire and China, a Buddhist from India, and a Catholic monk. Despite his great contributions Rashid met an untimely end, executed on suspicion of poisoning Persia’s king. The life and adventures of Alexander the Great, (356 BCE - 323 BCE) have been passed through history by so many hands, that most of the stories lend themselves more to folklore or hyperbole. According to one version, Alexander’s mother, Olympias, was struck by a bolt of lightning the night before her wedding, a foreshadowing of his great feats. True to history, the romance recounts how Alexander developed a keen mind as a student of Aristotle, ascending to the Macedonian throne when he was just 20. In a period of 11 years, Alexander had united the many Greek city-states and conquered Persia, amassing a kingdom that stretched from the Balkans to the Himalayas. Alexander himself claimed to be a demigod, the son of Zeus, up to his death. He ordered his people to bury him in a solid gold coffin in Alexandria, the capital of his kingdom. And they still call that place “The Tomb of Alexander” to this day. 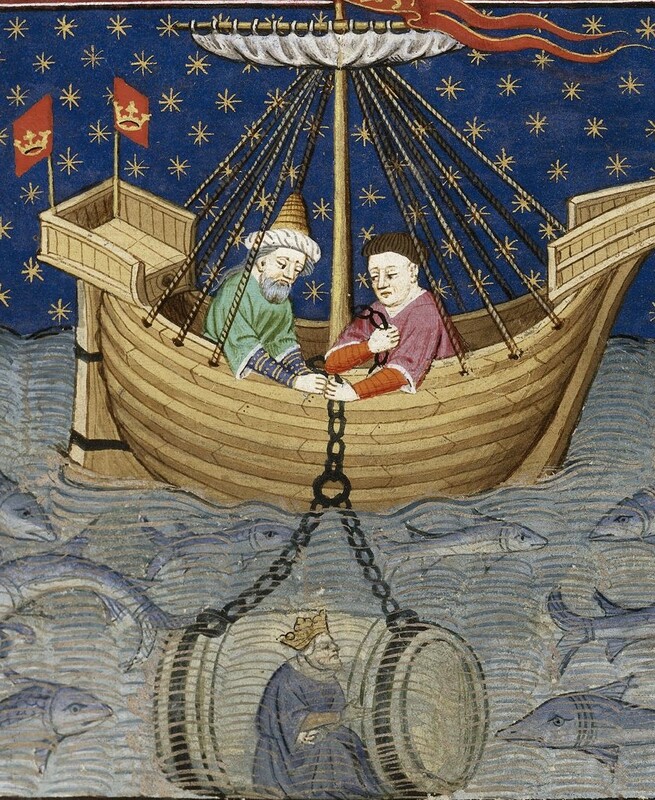 More than six centuries after his 24-year treasure hunt in Asia, Marco Polo, a Venetian merchant by trade, remains one of history’s most popular adventurers. He was among the first Europeans to chronicle the cities and technologies of 13thcentury eastern Asia, most of which was under rule by the Mongol Empire. His legend lives on today, the subject of a 2014 Netflix original that dramatized his tenure as an agent for Kublai Khan, the ruler of the Mongol Empire and founder of the Yuan dynasty. Little is known about Polo’s early years, other than that he probably grew up in Venice, Italy. At just 17 Polo travelled with his father on an expedition through the Pamir Mountains, on what would eventually be called the Silk Road, to present-day Xinjiang, in northwest China. Polo’s father, Niccolò, and his uncle, Maffeo, were popular merchants with the Mongolian Empire, and they served as Kublai Khan’s ambassadors. How much of the book’s stories are accurate remains hotly debated among historians. The fact that Polo dictated the book in a middle-ges prison has posed some challenges. For one, no authentic original of the manuscript exists. Editors of the text, many of them church authorities, have since found his account heretical and heavily revised the material. More than 140 versions of the book exist, each with stories that don’t match up with other versions. What cannot be contested are his contributions to better understanding Asia’s geography. His descriptions helped to give travelers valuable information on navigating the Silk Road, such as where to find rare spices. It was Polo’s depiction of Japan that inspired Christopher Columbus to set the island as a goal for his 1492 voyage. Love him or hate him, the man made history. century China, she emphasizes connections across these diverse times and cultures. Looking at interactions between peoples can create a fuller understanding of more isolated events. A prime example of this is the Silk Road, which spanned from the Korean Peninsula and Japan to the Mediterranean Sea, involving a rich exchange of different technologies and cultures that left indelible marks that can be observed today. Her current research examines origins of Eurasian concepts of early modernity, tracing the dynamics of cultural flow across Eurasia during the Mongol era. She argues that the turn to modernity in human history was more of a shared process across social and cultural zones than the unique product of any one society. 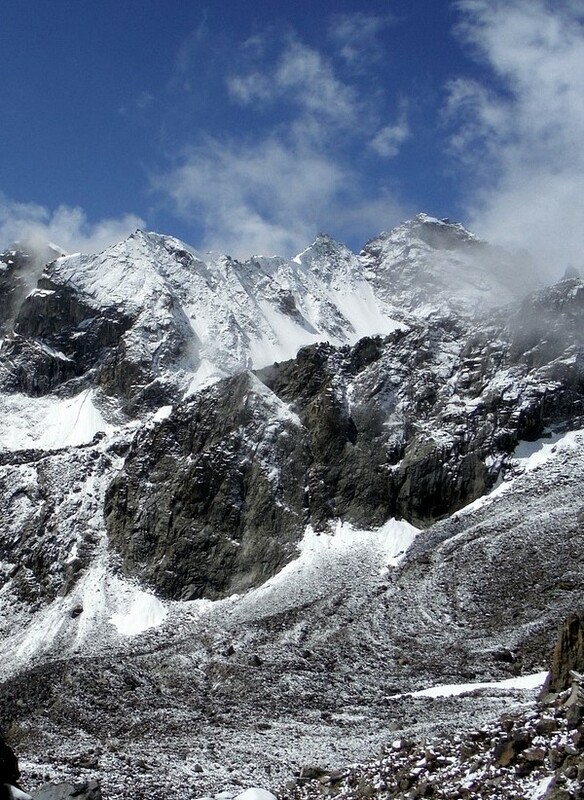 Prazniak’s research has taken her to China, Paris, Istanbul, and Ladakh in the Himalayas. Students will join Prazniak this spring on a new study abroad program in Italy. It will take them on an immersive journey through the Tuscan region that includes the cities of Florence, Pisa and Siena to learn about the historical and literary accounts of travelers who have explored the area since the 13th century. The program draws especially on famed Italian fiction writer Italo Calvino and his reconstructed conversations from historical explorers like Marco Polo and Kublai Khan.